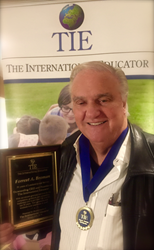 Forrest Broman, Founder and CEO of The International Educator (TIE) announces his retirement after 30 years at the helm of the non-profit international school newspaper and online recruiting agency. Forrest Broman, CEO of The International Educator (TIE) retiring with honors. I am honored and privileged to have been able to serve the international school community thanks to my excellent staff. Forrest Broman, founder of The International Educator (TIE) announced his retirement after an exceptional 30-year career as CEO and founder of The International Educator, a leading publication and recruitment firm specializing in international education. Mr. Broman is among the most well-known and respected figures in the field of international education and has made many significant contributions to the field. He has positively impacted hundreds of students, teachers and administrators through his role as superintendent of international schools and as founder and CEO of The International Educator (TIE) and The Principals' Training Center for International School Leadership (PTC). Mr. Broman’s career spans over 50 years, and includes experience in the legal, public service, education, small business and non-profit sectors. Upon graduating from Harvard Law School in 1965, Mr. Broman started his career as a Law Clerk to a Massachusetts Supreme Court Justice followed by a stint at a prominent New York law firm. Mr. Broman then went on to serve as the Deputy Commissioner for Addiction Services under Mayor Lindsay’s administration in the early 1970’s before getting into the field of international education. In 1974 Mr. Broman was appointed as the Superintendent of the American International School in Israel where he served for 17 years and was the school’s longest serving head. Following that Mr. Broman became superintendent of Escuela Campo Alegre, an international school in Caracas, Venezuela from 1991-1996. Mr. Broman lead these schools through very challenging circumstances and has garnered the praise of the entire school communities in which he served, including the many teachers and administrators he mentored, and most importantly, the students who he inspired and motivated to achieve their personal best. Following his headship of these schools, Mr. Broman founded The International Educator (TIE), a leading recruiting site and newspaper for international schools and The Principals' Training Center (PTC), one of the leading professional development and training organizations for international educators. Mr. Broman also served as an Associate Professor of Boston University’s Graduate School of Education from 1997-1999 where he helped to create and direct their International School Leadership Institute's Doctoral Program. This year TIE celebrates it’s 30th anniversary and Mr. Broman has announced his retirement, so that he may focus on family and the Children of Haiti Project or COHP. In 2010 Mr. Broman started the COHP School in Haiti in response to the tragic earthquake that devastated the impoverished island-nation. Mr. Broman plans to devote his time and energy to supporting the school and it’s mission of providing a quality education to Haiti’s most needy children. When not working on educational matters, Forrest is looking forward to spending more time with his grandchildren, fishing and traveling around the world visiting family and friends. “Through his creation of TIE, PTC, AISH and COHP, along with his many years as school head, Forrest has had a transformative, enduring imprint on the world of international schools,” said Bambi Betts, CEO of the Principals’ Training Center. “I can think of no other single colleague who has contributed so significantly to raising the bar on the professionalism and influence of our schools on teacher quality and thereby student learning." In addition to his innumerable professional accomplishments, Mr. Broman has spent much of his career sharing his expertise with his peers and mentoring students, former students, friends and colleagues. “Forrest built TIE by creating strong trusting relationships with school heads and staff from around the world. His dedication to excellence in international education and the leadership qualities he exemplified, directly contributed to the growth of TIE as a newspaper and online recruiting resource,” said Brittany Betts, who will be promoted to TIE’s Chief Executive position. The International Educator, located in Hyannis, MA, is a non-profit organization dedicated to developing links among teachers and international schools worldwide. In publication for 30 years, TIE is a quarterly newspaper featuring the latest in international school news and developments for K-12 educators around the world. TIE’s website, Tieonline.com, offers the widest selection of K-12 teaching and administrative jobs available anywhere. TIE's sister company, the PTC is the leading professional development training institute for international educators around the world. Both TIE and PTC operate under the umbrella organization Overseas Schools Assistance Corporation (OSAC). Cape Cod Times article on The International Educator (TIE)Based in Hyannis, MA The International Educator publishes an educational newspaper and serves international schools worldwide.